Have a router with OpenWrt installed ? Why not use it for something else ? As a OpenWrt PXE server for booting your favorite Linux/UNIX distro. Booting a recovery or utility live CD like Knoppix, CloneZilla etc. Configuring disk-less computer clusters etc. etc. The advantage of using a router as PXE server is far more cheaper than a PC with several NIC, run it 24x7 and low power consumption. I have seen that the cheapest routers with 32MB RAM works as good as a PC with 4GB of RAM, so lets do it. Router's USB is port is must for storing the installation files and installing extra software like NFS server. A PC or virtual machine is for testing purpose. An working extroot setup is necessary for routers with 4MB NOR flash storage, have a look on this detailed guide to setup extroot on openwrt router. An extroot setup may be necessary for your router depending on the amount of free NOR flash space to install the packages and it's dependencies. You could use a USB pendrive or USB external HDD, I'm using a 4GB USB pendrive for this purpose. There are two ext4 partitions, one 200MB partition for OpenWrt extroot setup and another partition as storage. Format the USB drive with your favorite utility like Gparted, fdisk or cfdisk, this step is done on a PC running Debian testing. Chane the /dev/sdd according to your's, like /dev/sdb etc. Wait some time to let the copying finished. Now disconnect the USB drive and connect it to the routers USB port reboot the router. Edit the /etc/exports file to setup the /mnt/sda2/PXEboot/ folder as NFS export directory, it should look like bellow. At this step the configuration file will be slightly different for each different Linux/UNIX distribution.Look at the sample configuration for booting lubuntu 14.04 32bit. If you want to boot other distros you have to figure out an working pxelinux configuration yourself. But remember this is not hard at all, just put your pxelinux configurations at the /mnt/sda2/PXEboot/pxelinux.cfg/default file and test them. It is also possible to directly loop mount the ISO files and use them for PXE boot server without extracting, read more about it here > setup a multiboot OpenWrt OpenWrt PXE server . This testing also could be done with a virtual machine like VirtualBox or VMware. For VirtulaBox add a Bridged network adapter from the Settings menu and select your ethernet interface like eth0, eth1, enp2s0 etc. And Change the Boot order to boot it from network. 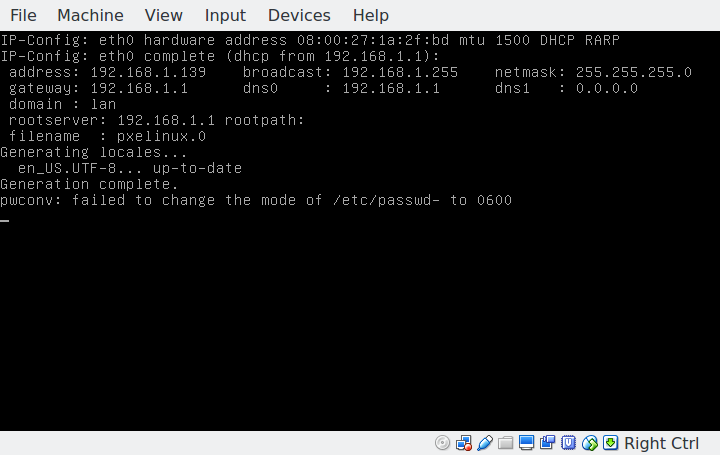 I hope this simple tutorial will help you to setup your PXE boot server on your OpenWrt router. Also don't forget to check the list of best ethernet cable I've made. You're going to need cables a lot with this experiment. If you have any question,problem or suggestion just leave a comment. just after KERNEL and INITRD you start the path with "tails". I presume it is due to the fact you finished the used path in the APPEND with tails. And I suppose the KERNEL and INITRD will then start from this APPEND (tails folder) as source for the vmlinuz and initrd. By considering this aspect it means that I must change the place where I put my iso files. Could I then keep it and just simply begin the KERNEL and INITRD with iso in place of tails ? I think you know the fact that the kernel and initrd are served to the client over tftp, not from the NFS server. The NFS server serves the root filesystem. The client machine could get kernel and initrd from the tftp server without mentioning the IP address. Why the lines after KERNEL and INITRD starts with a tails before them ? The /mnt/sda1/PXEMultiBoot/ is the tftproot directory and we have to show pxelinux the proper path to load the kernel and initrd. But for the NFS server, we have to show the proper full path with IP address to function it correctly. I think you also know that the ISO file could not be used directly without unpacking(or loop mounting) it somewhere. So it concludes to, just make sure everything is in right place, i.e. set proper paths in pxelinux configuration file and keep experimenting. Hope this will help you to understand better. There is also a initrd2.img at the same place. Sincerely thanks for your idea to first test this secure distribution. Just for information I first saw your multiboot PXE then this first PCE explanation. I began to write a bash script to automatically install all needed packages and parameters you explained. I still need to read it back to check it with the default installation existing on the given OpenWRT SD Card on my router. I remember I will need some little explanation to finally have a functional script. I will test it line by line to see if it works. If well I will send this script to you. You could then add it to your perfect tutorial page. As my router is a really perfect device to run this kind of PXE use I recommended to you to use the secure Tails distribution. We stay in contact to enhance your really perfect tutorial. Literally initrd.gz, initrd.img, initrd.lz, initramfs.img are same thing, gzip or lzma compressed cpio archive. So we have to try with the btoth combo, i.e. vmlinuz+initrd.img and vmlinuz2+initrd2.img . Assuming the tails ISO is loop mounted or extracted in the /mnt/sda1/PXEMultiBoot/tails folder, look at the sample pxelinux configuration for Tails. It may work or may not be, please tell me when you have a working pxelinux configuration for Tails. I'm waiting with excitement for your shell script to automate the whole thing. I'll soon download the Tails ISO file from somewhere, to use it myself. As of Slitaz, once I had it, about one year ago, before my hard drive crashed. It's really great, almost everything for a normal user with a super fast openbox based desktop inside the tiny ISO file. I liked it's simple CGI based configuration editor and the taz browser. Thanks for the advice, I'll add slitaz pxelinux configuration too very soon. I really want to deploy this use on my "speedy" router (banana pi R1 - 1 Gb RAM - 1 Gb LAN - internal SATA HDD 😉 ). It could be great to be able to use it in PXE because it is a light distribution based on Debian and it works great. Your hardware is really great for this purpose. I don't have the Tails installer CD/DVD ISO file and currently living with a very costly internet, so I can't download it right now. As Tails is also Debian based and it is a live system, so it could be done with the same procedure as in Lubuntu. We have to find out the kernel and initrd location and proper NFS server IP address then modify the pxelinux configuration. Could you post the syslinux/isolinux related configuration files(the isolinux.cfg, txt.cfg and gtk.cfg) somewhere ? i.e. in pastebin or here ? If it is a purely Debian based system, here a sample configuration, please check it if it works. I really appreciate your comment, thank you.